This is a little add-on I have made for the Skorten Pod bowstand. 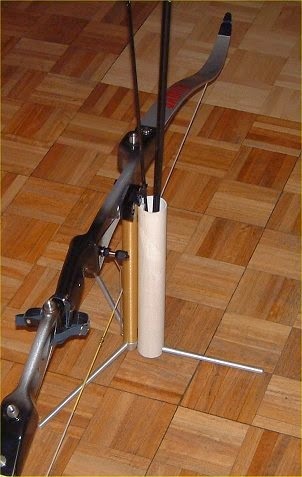 I like the Skorten bowstand, it is stable when in use and compact when taken down, but I wanted somewhere to rest my arrows while shooting indoors. So this is my solution. The ground quiver will easily hold 10 arrows. 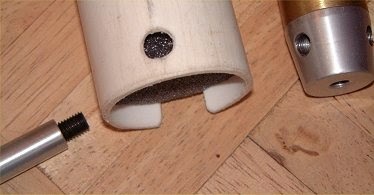 The top of the tube is held in place by the thumb screw which normally just holds the bow rest in place. Foam is pushed in to the tube to rest the arrows on. With the leg in place the foam can not be pushed out. A notch large enough for the leg to pass through is cut in the far edge of the tube. Opposite the notch is a hole just large enough for the thread of the leg to pass through. The screw in leg holds the quiver in place. The ground quiver is made from a short length of waste pipe held in place by the top thumb screw and one of the screw in legs. The pipe has to be at least 12" (305mm) long. The notch for the thumb screw and the hole for the thread of the leg, must be in line on one side of the pipe. A 75mm (3") length of tightly fitting foam is pushed in the bottom for the arrow points to rest on. Tube outside diameter = 43mm (1 3/4") approx.